Senior guard Ben Brust was 6 of 9 from the field, including 4 of 7 from 3-point range, and finished with 17 points in Wisconsin's win over American in its NCAA tournament opener. MILWAUKEE — Ben Brust recognizes the next Wisconsin loss will end his college basketball playing career. And so, the Badgers’ senior sharpshooter is doing whatever he can to put off that fate for another game, another weekend. On Thursday, that meant Brust was center stage again, scoring from various angles around the 3-point line. Brust buried four 3s and scored 17 points. He also was responsible for a few of the bigger offensive plays of the first half for the Badgers during No. 2 Wisconsin’s 75-35 drubbing of No. 15 American in an NCAA tournament West Region opener at the Bradley Center. The first came when Brust hit a 3-pointer to bring Wisconsin to within 19-18 at the 6:09 mark. He converted a jumper two minutes later to tie the game at 20, and 30 seconds later, his three-point play put the Badgers ahead for good, 23-20. Brust finished the game an efficient 6 of 9 from the field, including 4 of 7 from 3-point range. 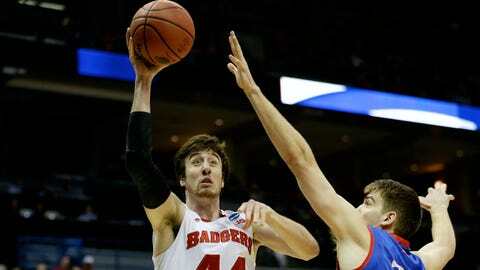 "He’s playing confident," Badgers guard Josh Gasser said. "And also doing whatever it takes to keep playing. He knows his career is winding down here. So he’s going to do whatever he can to help us win. He’s been knocking down shots the past few games. When he’s hitting shots, he just gets more and more confident and makes us so much better." Brust’s 4-for-7 performance from 3 tied Kammron Taylor (against Arizona in 2006) for the fourth-best 3-point percentage by a Wisconsin player in an NCAA tournament game. It also brought his career 3-point total to 224, which is now only three shy of tying the program record established by Tim Locum (1988-91). "I didnât know that," Wisconsin forward Sam Dekker said, "but he’ll probably get it. He’s a flamethrower. Thatâs all you’ve got to say about Ben." In late February, Brust endured a difficult stretch in which he made 4 of 22 3-pointers over three games against Michigan, Iowa and Indiana. But he has found his range of late. Over the past three games, which include two in the Big Ten tournament, he has made 11 of 22 3-point attempts. Such a run has put Brust in position to break the all-time 3-point mark in Wisconsin’s Round of 32 game against Oregon on Saturday. Brust, of course, brushed off any talk about him attaining the record. "The most important thing right now is winning basketball games," he said. "I feel like if we keep winning basketball games, naturally that would just come with it. So if we win, I’ll be happy." Crowd talk: The Badgers played as close a thing to a home game as they’ll get during the NCAA tournament with an opening-round game in the Bradley Center. The announced attendance for the first session was 17,749, and many of those thousands were on their feet as Wisconsin mounted its early comeback. Players took notice of the atmosphere. "You don’t get some of those possessions where the crowd just stands up, everyone gets going trying to get their team into it," Dekker said. "You don’t really get that with a neutral court. To have that tonight was huge for us. It gave us a spark, gave us a little life and made us feel like we were kind of back at the Kohl Center. It’s only an hour from home. We had a great turnout. It was great to see our fans out here." Added Gasser: "It was awesome. When we went on a few runs, it was great to have the crowd behind our back. It seemed like we were playing a home game a little bit there. That’s awesome to have. But it’s not going to help us going forward. We’ve got to do it on the court."